This book is full of helpful information and pretty patterns that both beginners and more experienced sewers are sure to enjoy. You will find many helpful tips on the nature of wool and how to applique it. Wool is a sumptuous fabric. The colors are rich, the texture is inviting. 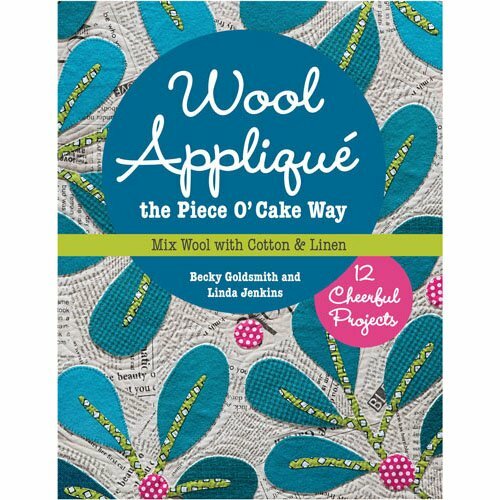 Wool is particularly interesting when it is mixed with cotton and/or linen fabrics, as we do in this book. Inside you will find 12 cheerful projects that include wall quilts (small and large), a foot warmer for the bed, small kitchen quilts, a table runner, a zippered pouch, and more. Click here to see a video showing you what's inside the book. Click here to see additional photos of projects in this book. I've made more videos about wool applique. Click here (or on the Video link in the menu bar).